Anna brought a ton of experience with her when she came to WomanTours. 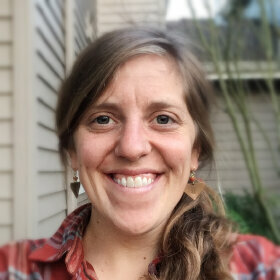 She led many bicycle tours in Alaska and Arizona before coming to us and she's since led our Southern Tier cross-country tour twice as well as many of our shorter tours. She has an infectious laugh, a ton of energy and a huge heart! "Superb, outstanding, marvelous. It was a true joy to be on a trip with Anna. She really outdid herself with all of our personalities, requests, etc. Thanks to Anna, this trip became a magnificent ride that I will always carry with me."